Welcome to another exciting edition of Behind the Cover with your host – Michelle Lee. This time the topic is what I like to call the X-Factor in covers. You know what I mean, that little bit of extra something that isn't easy to define, since it varies from cover to cover – but it is there. If you missed past episodes of Behind The Cover Artist's Curtain, you can check them out online. For my first example of the X-Factor, I want to look at series books, since it is easiest to pin-point that little bit of something extra when comparing books that belong together. Now looking at the cover, you see similar elements. The witch diver bar. The guy is on top and the woman on the bottom. The fonts (placement, color and style) are all the same. Now you would expect to see something similar with series books – at least those covers I do for series books. (Check out my last post if you don’t know why – just scroll down to the end). So what’s different, besides the actual images themselves? To start, let’s a close look at the divider. Notice the stars? See how they change from cover to cover? Instead of keeping it stationary and in place, I have it shifting slightly with each cover. That’s the X-Factor. Also, see the cat in the first cover? Here’s a hint – it is on top of the author’s last name. Now look at the second cover. Is the cat in the same spot? Nope – in fact, when you do find it, you will see that it isn't even the same cat silhouette. Now … let’s look for it in the third cover - again, different spot and different silhouette. Again, this is the X-Factor. Just a little fun I had while putting the covers together. It also allows the author to have fun now with promotions … maybe even inviting readers to find the cat in the cover. In this particular case, the author enjoyed the play on the witch’s cat so much she added one into the story. I already mentioned in the series post about Jamieson Wolf’s Hope Falls series, how the background shifted with each book. But what about covers that aren't for books in a series? Do they still have X-Factor potential? 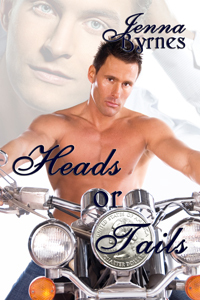 Well audience, let’s look at another set of covers - this time for Erin Quinn. The X-Factor in these covers is a little more subtle … but if you look, it is there. Starting with Kissing Kris Kringle … notice the I’s in the title … see the snowflake that dots it? Also, the I in Erin’s name is the same way. Now look at the I in Erin’s name in the cover Shaking It Up. See the heart? That’s a little X-Factor. Now let’s look at a couple more covers. Jenna Byrnes’ Heads or Tails involves, well, a quarter coin toss. : ) So, if you notice, behind the word TAILS the headlight, it has a quarter. Just kind of hidden there; a little bit of whimsy. 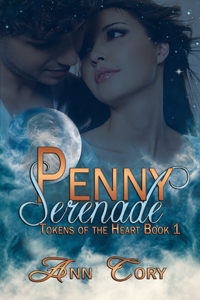 Oddly enough, another coin is found in Ann Cory’s Penny Serenade. Pennies obviously play a key component in the story … so within the moon, which is also something that is important in the story, is the silhouette of Abe Lincoln from a penny. Another good example is the cover for Jamie Hill’s Impulsive. Since there are four stories in this collection, I wanted to try and get a little something from each of them worked into the cover. There’s the bottle, for the genie story. A trumpet for a jazz based tale. Snowflakes and a mystical mist, for the other two stories – one of which involves a ski vacation and the other – you guessed it – magic. Basically, what the X-Factor boils down to is the stuff that I have fun adding in. Something that maybe the author didn’t necessarily call for in their cover art form, as in the case of Micah the cat for Gail’s covers, or if they did, there wasn’t a real way to work it in except by doing something subtle, like with Ann Cory’s Penny. Either way, planned by the author or not, these little things make their covers stand out just a little bit more. It also helps to prove a basis for a “can you spot the ______ ” kind of question for contests. And that concludes this edition of Behind the Cover. I really do hope that you have enjoyed this brief glimpse into what goes on in creating a cover – or at least covers I create. Next up is author branding. After that, I don’t have any ideas right off of what I will talk about, so if there is something you would like to see that I haven’t covered yet – leave that info in a comment. Holding the promise of a new cover in front of a writer's like holding out candy to a kid. And we have the best. Yeah, that black cat gets around. And became an integral part of the War-N-Wit's. Many thanks! Love it all Michelle. Am off to look at the covers you've done for me to find the X factor in each of them. Thanks for another very interesting post. Janet - Thanks! I'm glad you are finding it informative. Gail - Yep, he sure does. are you planning any more books in the series, or are you done? Sheila - Not all of the covers lend themselves to the X-Factor, unfortunately. But I do try as often as I can to work something in. 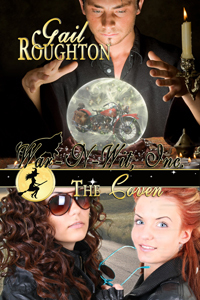 Well, honestly, Michelle, as to whether there'll be any more Wars -- at the time I finished The Coven, I thought no. Because the gang was really being persnipity about talkin' to me. As in they didn't want to. But then they did, and I was really pleased and actually amazed at the final product. So if they decide to keep talkin'--yeah, there'll be more. But I don't make any promises, and for sure not as to when. But DON'T put my Witch on her Broomstick in the archives just yet! I'm curious as to when you decide to put in these little details. What leads you to think they're needed? Are they part of your original concept, or a bit of an inspiration afterward? That is so clever of you to incorporate that "little extra," object. I will have to check your other covers more carefully and see if there is more to them than what initially meets the eyes. Lisabet - Sometimes I know ahead of time that I am going to work something in, and other times it's a cute "can I do this" kind of a moment, where something comes to me and I want to play around and have fun with it. Jude has been really receptive to those moments. Margaret - Not all of them have something extra. Some I just didn't know enough about the story to add something in. Or the cover was too busy. But where possible, I have tried.